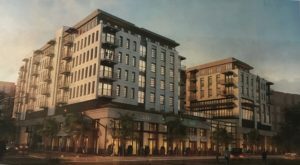 This is a request for Conditional Building and Site Design Review (CMSDR) approval to build an eight story mixed-use building.The development is proposed to be approximately 85′ in height and include 186 apartments and 16,000 square feet of retail space. This exceeds the 50′ height allowed in Sugar House Business District-1 zone. The applicant is also seeking modification to a 15′ upper floor step-back requirement for the NE portion of their building that faces Highland Drive. This proposal will be on the Sugar House Community Council Land Use and Zoning Committee meeting April 15 at 6 p.m. in the Legacy Sugar House 1212 Wilmington Avenue 5th Floor Fairmont Room. Come and see the plans, and provide feedback. Or, read through the plans below and send an email with your comments. To provide feedback to the SHCC to be included in their letter to the Planning Commission, email judi.short@gmail.com.